Father’s Day in China (except Taiwan) is on June 17 in 2012. Taiwan celebrates Father’s on August 8 each year and China celebrates it on the third Sunday in June. Why sending flowers to Dad? Fathers Day is the one day each year that sons and daughters can really show their dad how much they care about him. Looking for Father’s Day gifts beyond ties and golf knick-knacks? There are many ideas to celebrate father’s day and it’s good idea to spend father’s day with the entire family together. But you are thousands miles away, sending gifts online is best choice also. 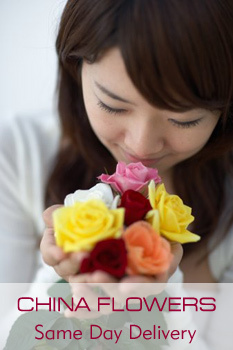 Try Father’s Day flowers and gifts from ChinaFlowers.net. Men love receiving flowers and plants just as much as women! Why not surprise dad with a flowering plant or some fresh cut flowers this father’s day? Sending flowers to a man can be a little tricky, read these three helpful tips and keep them in mind when ordering for father’s day! Men are stimulated by color and are visually oriented. Research shows that men prefer vivid colors such as yellow, orange and red. Flower arrangements that are contemporary, linear styles or natural styles are best. Other favorites might include green or flowering plants. Let us know that you are ordering flowers for a man and ask for specific suggestions. If your father has a hobby, perhaps you could highlight that. For example, if he is a golfer, tuck in a box of golf balls. If he is into cars, add an auto magazine or two. ChinaFlowers.net Florist can offer creative suggestions for flowers that are sure to please. Celebrate your Dad by sending a unique Father’s Day gift or flower bouquets. Florist arranged and delivered to make your Father smile this Father’s Day. “A Father is someone who carries pictures in his wallet where his money used to be.” - Author unknown.